Waiting on Wednesday is a weekly meme hosted by Jill at Breaking the Spine, that spotlights upcoming releases and books we can't wait to read. My pick is Vitro by Jessica Khoury! A death-defying tropical adventure delivers a frightening message about dabbling with creation from the talented author of Origin. On a remote island in the Pacific, Corpus scientists have taken test tube embryos and given them life. These beings—the Vitros—have knowledge and abilities most humans can only dream of. But they also have one enormous flaw. Sophie Crue is determined to get to Skin Island and find her mother, a scientist who left Sophie behind years ago. She enlists hunky charter pilot Jim Julien to take her there. But once on the island, Sophie and Jim encounter more than they bargained for, including a charming, brilliant Vitro named Nicholas and an innocent, newly awoken one named Lux. In a race for their lives, Sophie and Jim are about to discover what happens when science stretches too far beyond its reach. 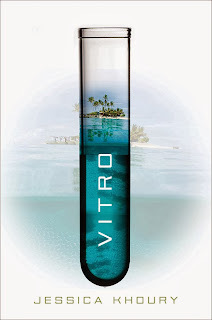 I'm so excited for Vitro! I really enjoyed Origin, and I like the idea of Vitro being a companion novel rather than a sequel. It'll be nice to read about new, different characters. I can't wait to pick up a copy of Vitro when it releases on Jan. 14, 2014. I am really excited about this! Great pick.